By the time I started actively editing RECKONING 4, my ambivalence about video games had deepened in multiple directions. I couldn’t deny the escapist pleasure I often took from my game sessions, particularly during professional and personal crises. That pleasure was tempered by the tedium of staging, capturing, transcoding and organizing footage from these sessions, and soured by the casual misogyny that permeated so many popular games and the culture surrounding them. So I looked to podcasts hosted by prominent video game journalists for non-male voices, for critical and feminist discourse on game culture, and I engaged in dialogue with several students I worked with about the pleasures, perils, and unexplored artistic possibilities of video game forms. One of these students, Bryce, agreed to an interview with me (via headset chat) after his own ambivalence brought him to something of a crisis point. He realized that he’d essentially become addicted to video games, to the detriment of his studies and overall well-being. We spoke for several hours and played what he’d decided would be his last game session before selling his console. Our conversation figures prominently in this piece and will presumably be woven into subsequent installments. RECKONING 4 also documents my first and only (so far) attempt to talk to strangers in an online multiplayer game. If RECKONING 3 represented cinema looking at video games (Michael Douglas wandering a marble-columned virtual reality corridor, Siskel and Ebert playing with an early infrared motion game controller, Hollywood leading men and game avatars composited via flicker editing), RECKONING 4 presents a fantasy in which figures from cinema, video games and the “real world” listen to and gaze at (or past) each other. 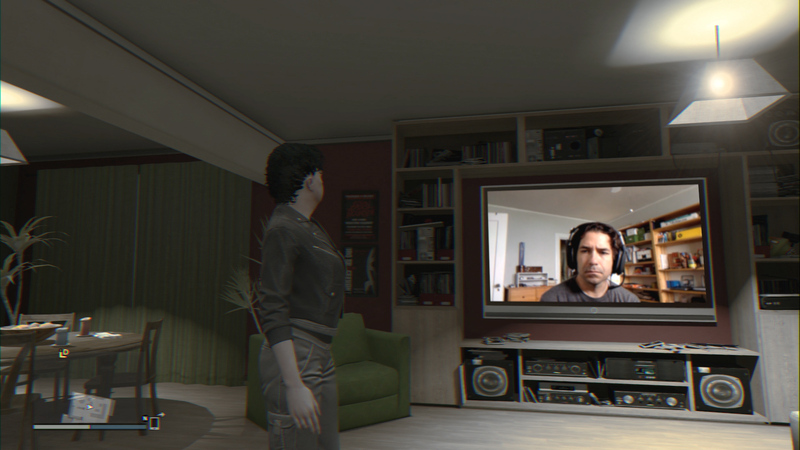 TVs in video game apartments show me talking and listening to Bryce, a Nightline segment on the harassment of female gamers, and the hapless, terribly acted middle-aged gamer protagonist from RECKONING 3. Game scenes are revealed to be on screens in other scenes. Conventional cross-cutting and detailed sound design create the illusion of permeability between these realms, of “life” unfolding as channels and stations are restlessly changed, of continuous ennui occasionally interrupted by menace (Kevin Spacey as politician gamer and uncanny valley villain).